Following Kirk Herbstreit's comments Saturday morning, ESPN's play-by-play broadcaster called Petersen "irascible and somewhat cantankerous" Saturday night. Chris Petersen wasn’t trying to pick a fight with ESPN. At least, it didn’t feel like he had any beef with the Worldwide Leader when he spent time last Monday lamenting Washington’s late kickoffs. He called the after-dark kickoffs “painful.” He apologized to UW fans for all the late starts. He bemoaned that “no one” on the East Coast watches Pac-12 games that late. What he did not do was point fingers at any one or any one entity. Not at Pac-12 commissioner Larry Scott. And not at ESPN. ESPN, it seems, felt disrespected anyway — so much so that Kirk Herbstreit called out Petersen on “College GameDay” Saturday morning, saying the Huskies “should be thanking” ESPN for airing their games. Petersen had to be taken aback by that. Things got worse during ESPN’s broadcast of Saturday night’s UW-Cal game at Husky Stadium. He’s not wrong about that — the Huskies’ nonconference schedule (Rutgers, Montana, Fresno State) is indefensibly soft, as has been written here before. And if the Huskies don’t go undefeated during the regular season, there’s a chance the CFP committee could leave them out of the playoffs (even as, let’s say, a one-loss Pac-12 champ) in part because of that nonconference schedule. All that said, can you imagine ESPN pulling that kind of stunt — lining up three cupcakes on the sideline during a game — at, oh, Alabama? The Huskies have a right to feel a little insulted by that. In the fourth quarter, ESPN play-by-play man Mark Jones piled on more, and in doing so offered another explanation for ESPN’s frustrations with Petersen. It’s true, Petersen did not have a face-to-face meeting with ESPN’s broadcasting crew, as most coaches — in college and the NFL — do the day before a game. Jones and Gilmore, it seems, took this as a personal slight. 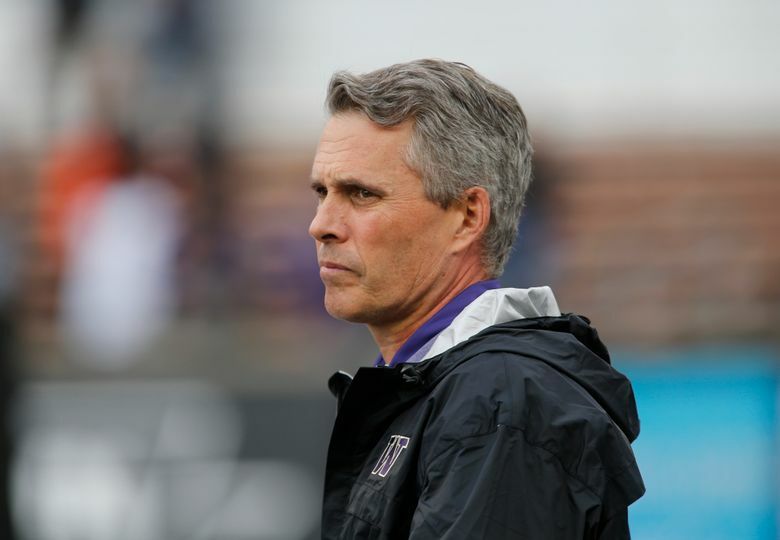 That, however, is nothing new for Petersen, who does not do in-person interviews with any of the broadcasting crews the day before games — whether they’re from ESPN, Fox or the Pac-12 Network. Instead, what he does do is a phone interview with the broadcasters; in this case, ESPN declined the phone interview with Petersen. Again, day-before interviews are fairly common practice around football, and looking at this from ESPN’s perspective, it’s not unreasonable for them to be a bit miffed the lack of access. ESPN, after all, is paying a fortune for rights to broadcast Pac-12 games, and it no doubt believes it should have certain privileges that come with those broadcasting rights. After Saturday night’s victory, Petersen said he hoped the whole issue would go away. At 6-0, the Huskies have put themselves in position to make another run at a CFP berth in the second half of the season. But beyond their remaining six regular-season games, one new foe has suddenly emerged — and the Huskies might find that ESPN is no cupcake. Huskies beat writer Adam Jude gives his three takeaways from UW’s 38-7 win over Cal (Ben Arthur / The Seattle Times).